We have heard it said many times before; I prayed but God has not answered my prayer. 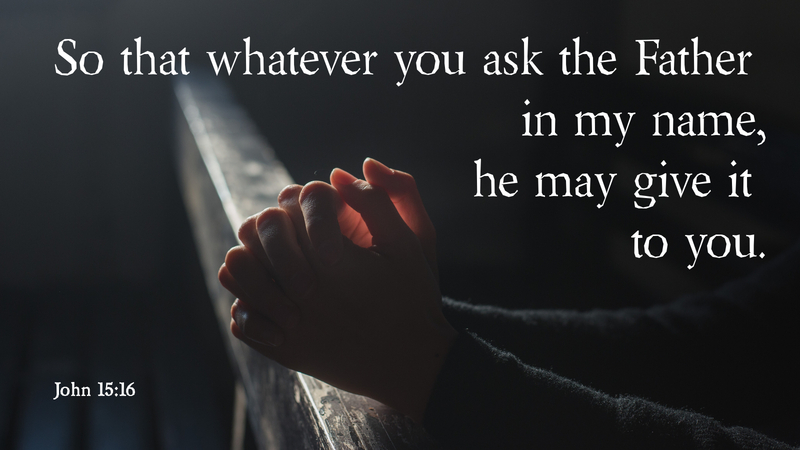 What is more likely is that following our prayer, we have not taken the time to wait for God’s response, or turned an attentive ear to listen for his answer. Yet, scripture teaches us that it is God’s good pleasure to provide all that is needed for life. We should not doubt that God hears our prayers and answers each one according to his will. John reminds us that as Jesus gathered with his disciples, he commanded them to love one another. Through love, God saved his people. In the greatest act of love, Jesus laid down his life for the sake of humanity. It is through this one unselfish act that God pours out his mercy and grace upon all who believe. Surely, the God who would go to such lengths to save his people would certainly hear and answer their prayers. Jesus says that as we abide in the love of God, the Father will provide that which we ask for in Christ’s name. The answer may not come in the fashion we imagine, or in the time we expect it. But trusting in God’s promise frees Christians from earthly worry. We know his promises are true, for such is the power of God’s love. Prayer: I thank you heavenly Father, that you hear my prayers and answer them in steadfast love. Amen. This entry was posted in Prayer and tagged Answers to prayer, God answers prayer, Holy Scripture, Jesus Christ, Love of God, Power of Prayer, Pray, Prayer, Salvation, Spirituality. Bookmark the permalink.